Superintendent of Schools Elliott Landon discusses an expected reduction in state education aid of about $1 million with the Board of Education on Monday. WESTPORT — Uncertainty loomed over Board of Education finances Monday as a $113.1 million budget for 2016-17 was formally adopted — the same amount approved earlier this month by the Representative Town Meeting — with a 1.31 percent increase over current spending. But uncertainty remains as town and school officials consider how to accommodate a reduction of about $1 million in state education funding to Westport for the new fiscal year. The expected cut in the state’s Education Cost Sharing money, about half the amount initially proposed by Gov. Dannel Malloy, follows adoption of a nearly $20 billion state budget designed to close a deficit of just under $1 billion. 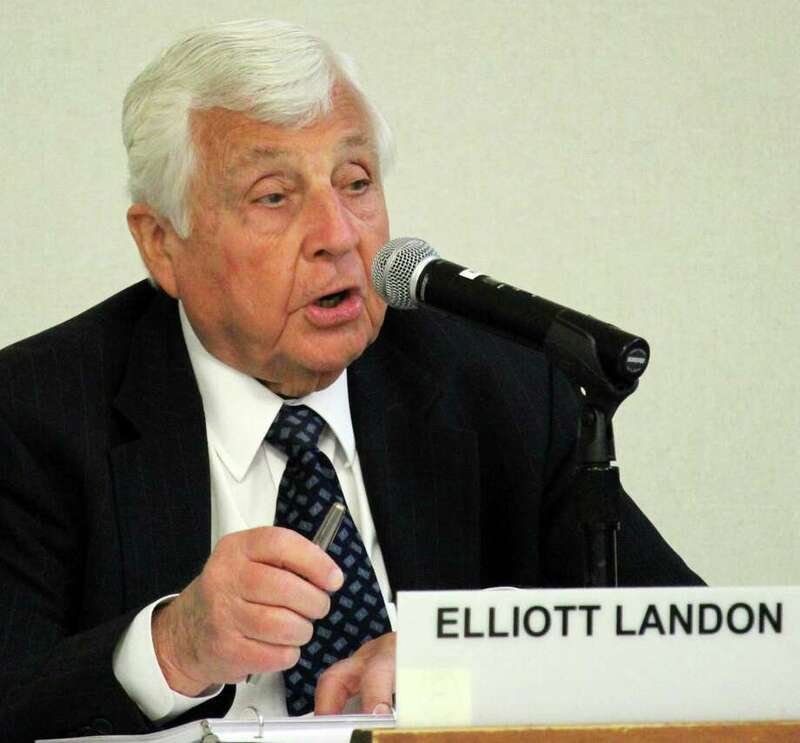 In a letter addressed to the school board, Superintendent of Schools Elliott Landon said that he and Director of School Business Operations Elio Longo are formulating a "year-end final expenditure estimate that will enable to make a substantial contribution to the town of Westport that will mitigate the excessive quality of the reduction in state aid … Stay tuned!!!" "But we’re waiting to see what our financial outlook looks like," Landon said at Monday’s meeting. "We’ll be in a better position” by late May or mid-June to ascertain how the potential reduction can be accommodated under the town’s already-adopted budget. The new fiscal year starts July 1. Board Chairman Michael Gordon remarked that the panel was "caught in the whole budget process nine innings in," adding they should plan for a similar cut in the coming year. Although the state-level spending cuts are a cause for serious concern, Gordon said, he lauded school administrators for their work to prepare a budget that both upholds the high standards of Westport public schools while complying with the Board of Finance’s request of staying within a 1.5 percent spending increase over the current budget. "You guys did a great job. Led by captain, superhero Elio Longo …," Gordon said. "I really want to thank everyone. Elliott, your leadership on this budget was outstanding …," said Gordon, who went on to thank all the central office administrators. "As I said and Jeannie (Smith, the board’s vice chairwoman) said when she presented to the RTM, we represent your great work. We have so much confidence in you guys and really appreciate everything, so thank you guys." The school board plans to meet again Monday to review its budget status for the new fiscal year.